SRA however doesn't provide directly the fastq files that we commonly work with, they prefer the .sra archive that require specialised software (sra-toolkit) to extract. Sra-toolkit has been described as buggy and painful; and I've had my frustrations with it. In this post, I'll share some of my best tips sra-toolkit tips that I've found. Featurecounts is the fastest read summarization tool currently out there and has some great features which make it superior to HTSeq or Bedtools multicov. FeatureCounts takes GTF files as an annotation. This can be downloaded from the Ensembl FTP site. Make sure that the GTF version matches the genome that you aligned to. FeatureCounts it also smart enough to recognise and correctly process SAM and BAM alignment files. Here is a script to generate a gene-wise matrix from all BAM files in a directory. The data are now ready to analyse with your favourite statistical package (DESeq, EdgeR, Voom/Limma, etc). Compare all data points - using a correlation analysisCompare sets of up and down-regulated genes - using a binomial or Fisher exact testCompare sets of genes within a profile - such as GSEA test In this post, I'll describe how correlation analysis is used between expression data sets of all detected genes. Merging data sets No matter what type of correlation used, the profiling data sets need to be merged. This means selecting a field that can the datasets can be merged on. This could be a array probe ID, gene accession number or gene symbol as in this case. I will compare gene expression profiles from two experiments (azacitidine in human and mouse cells). 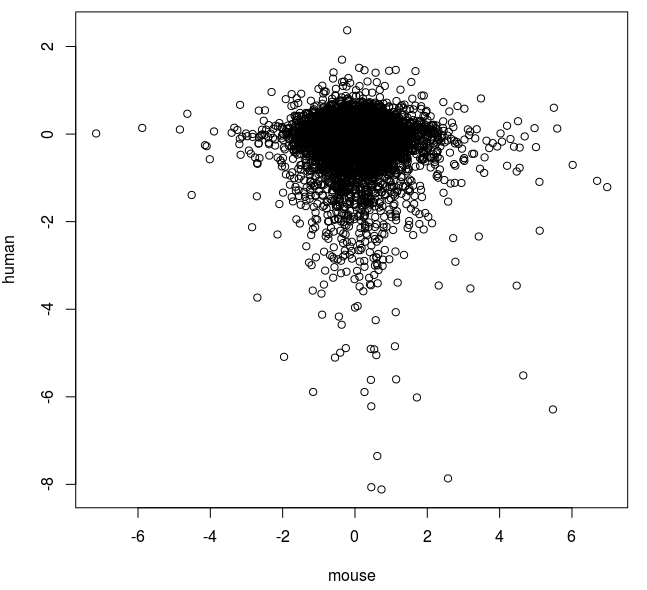 The human gene profile was generated by RNA-seq and the mouse data set by microarray. Turning a gene expression profile into a ranked list is useful for comparing with other profiling data sets as well as an input for preranked GSEA analysis (example here). In this post, I describe a simple bash script called rnkgen.sh that can take gene expression data from a range of sources, such as edgeR, DESeq, GEO2R, etc., and generate a ranked list of genes from most up-expressed to most down-expressed based on the p-value.